Which future will future generations inherit from us? Thriving future for all worldwide? Or. Endangered future for all worldwide? Our current path is not toward a thriving future. We have a choice. We have the ability. We must care enough. We shouldn’t just build better parts of our future. Parts are not enough. Together we must build better parts and build the whole better, thriving future. With philanthropy’s strong support, together we must and can build a thriving future for all. 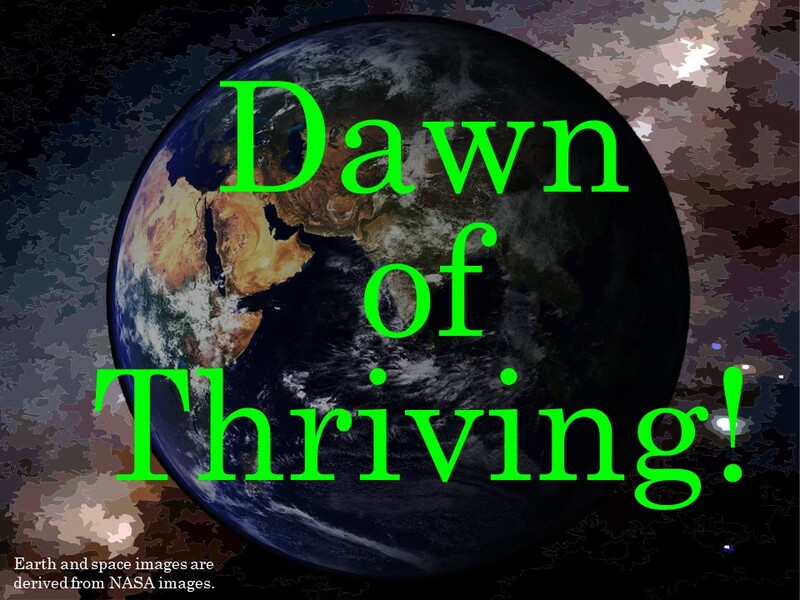 New Video – Dawn of Thriving! On eve of extinction, choose extinction or thriving. On our eve of extinction. Avoid extinction! Chose thriving! Avoid extinction! Build Thriving future! So you don’t believe we’re on the eve of extinction? On our eve of extinction, which future do we choose and achieve? Extinction? Thriving? For those who want to build and achieve a healthy and thriving future for their family and friends, community, country, and world, the Thrive! Endeavor and HealthePeople are here to help. All services are provided free. For those who want to experience and interact with a large collection of Thrive! abstract sculpture, GChris Sculpture is here to experience. Sculptures can be acquired in exchange for donation to Thrive Scholarship Fund. Whether for building a healthy and thriving future or to experience Thrive! abstract sculpture, you are welcome to contact Chris via email [GChris@GChris.com ] or phone [301-318-3760]. Visitors are welcome at the Thrive! Center. Best to arrange visit via email or phone.You are most welcome to come meet with Thrive! Founder and Sculptor Chris. Since the beginning of the universe, we have observed many worlds. Many thrive throughout their existence. Many fail to thrive. Some go extinct. This is the story of one that stood at the edge of extinction. Can it escape extinction? Can it possibly survive and thrive? Can it do so by its own actions. This is the story of humans. Their attempt to escape from extinction. Their Thrive! Endeavor. This is the story of Earth. Is this the end? Or the future when all thrive forever? To thrive or not to thrive? Since beginning of the universe, we have observed many worlds. Many have thrived throughout their existence. Many continue to thrive. Some fail to thrive. This is the story of one that failed. One that failed by its own actions. This is the story of the human species. This is the story of Earth. America thrives, together with, not at the expense of, the rest of Earth. Make America and Earth great! Which Future? Current bad future? Just surviving future? Or the best, Thrive! future. Vulnerability minimized. Survival extended as long as habitable Earth. Full thriving for long term and all people and Earth. Over 100 sculptures and thoughts in new art book available @ Amazon.com as paperback or Kindle book. Thrive! ® Sculpture & Thought by GChris is mission-driven and supports building a surviving and thriving future for all forever. It supports Thrive!® (@ ThrivingFuture.org) and the Thrive! Endeavor® (@ ThriveEndeavor.org) to create and empower a vast, sustained human endeavor building and sustaining a thriving and surviving future for all forever. 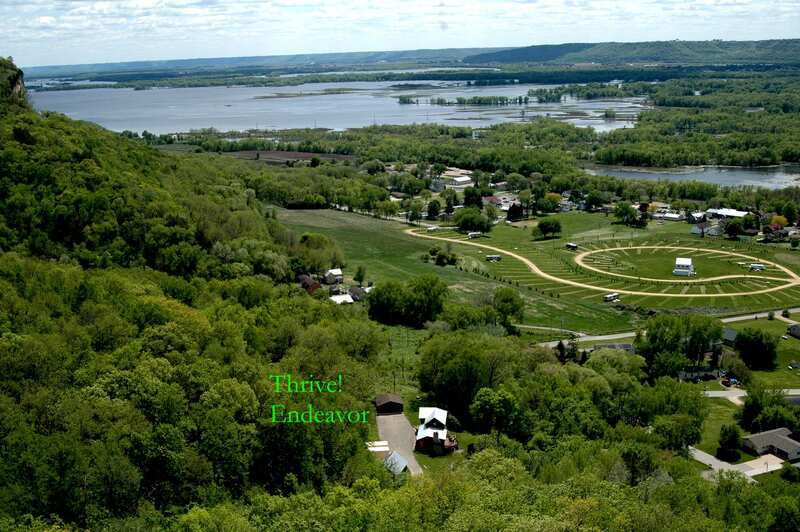 Thrive Endeavor Home is on Mississippi River bluff side in restored 1885 farmhouse, barn and beehouse nestled 100 feet above the Village of Nelson (WI). 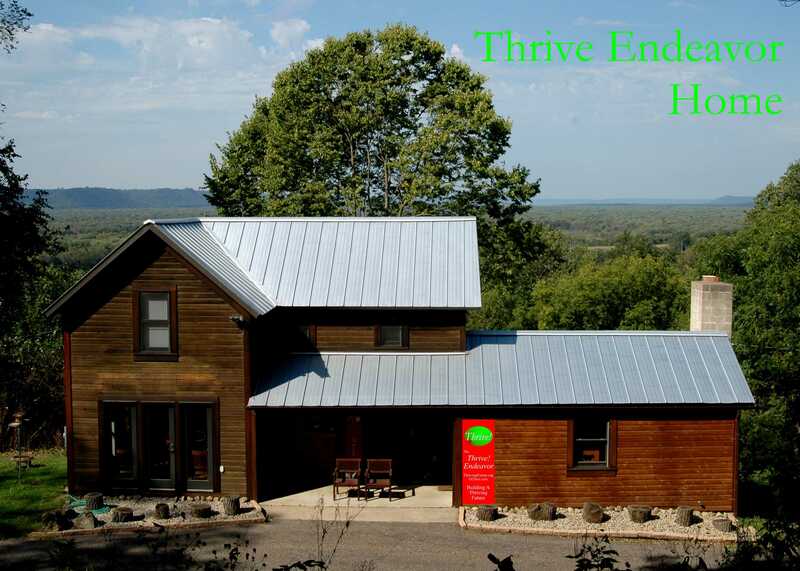 The home of the Thrive Endeavor is on a Mississippi River bluff side in a restored 1885 farmhouse, barn and beehouse nestled 100 feet above the Village of Nelson (WI). It is surrounded by Thrive! Park, a 25+ acre, bluff side, public park donated by Chris. 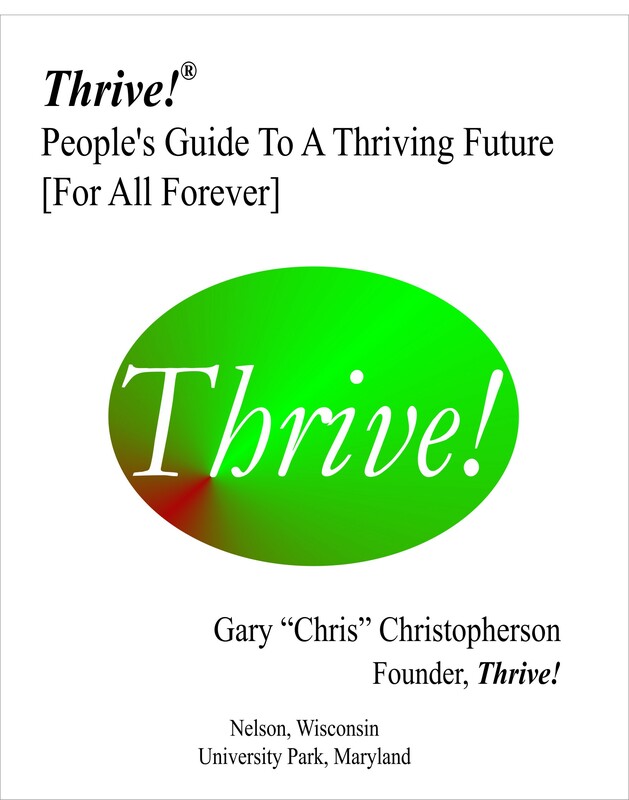 This is where Gary “Chris” Christopherson, founder of Thrive! and the Thrive! Endeavor, lives and works. 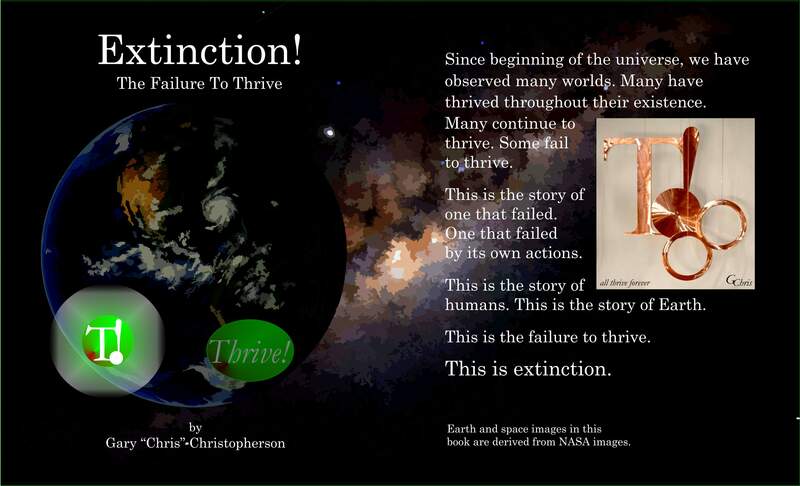 Visitors can meet with Chris and learn about, discuss and/or join the Thrive Endeavor. Visitors can read and discuss the several nonfiction and fiction books in the Thrive! book collection written by him. Visitors can learn about and discuss the overall vision, mission and strategy of Thrive! – a future where all thrive forever. The Thrive! Endeavor envisions a thriving and surviving future forever for all (for you, families and friends, communities, countries and world; for everyone and everything). Its mission is to create and sustain large, positive and timely change that builds and achieves a surviving and thriving future for all forever. It strives to create and empower a vast, sustained human endeavor building and sustaining thriving and surviving future for all forever. Those wishing to learn about, discuss or join with the Thrive Endeavor should feel free to visit. To arrange a visit, contact Chris at GChris@GChris.com or 301-318-3760. Thrive! – People’s Guide To A Thriving Future – provided to help family and friends, community, country and world survive and thrive. 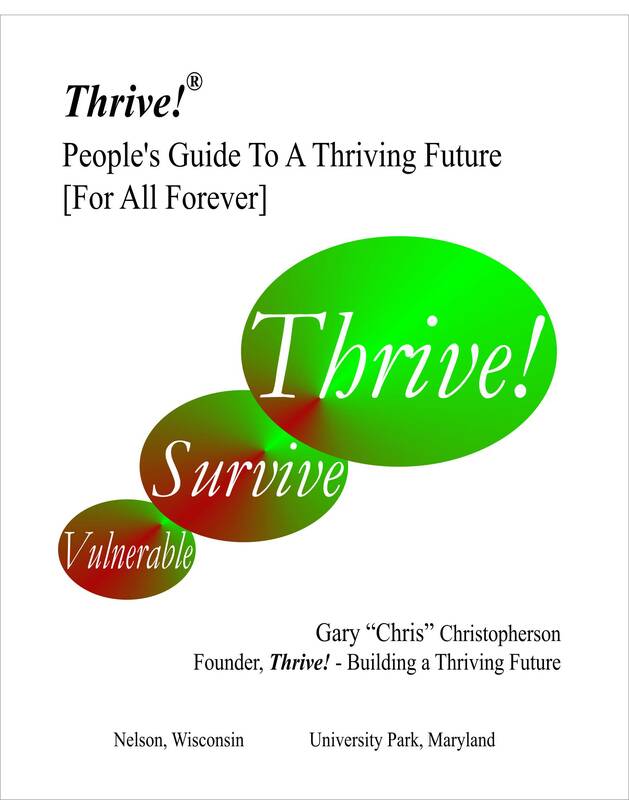 People’s Guide To A Thriving Future [For All Forever], in both “Quick Guide” and “Complete Guide” versions, is provided to help you and your family and friends, community, country and world survive and thrive. Nonpartisan Commitment to America’s Vulnerable. Action! – First, we need to get more people back to work in productive and rewarding work as soon as possible. Second, we need to make and keep health care affordable without sacrificing quality and access. Both are feasible if we have the will. America’s leaders need to make a nonpartisan commitment to make that happen and now. Endangered American Dream. Build Thriving Future. A survivable future? A thriving future? Americans desperately need and want both! Will America get it? That is the question. Today we must end the pain and reject the fear. Partisanship must end. Nonpartisanship must lead and govern. Tomorrow must be about a survivable, thriving future. Tomorrow must be about recovering and delivering the American dream.